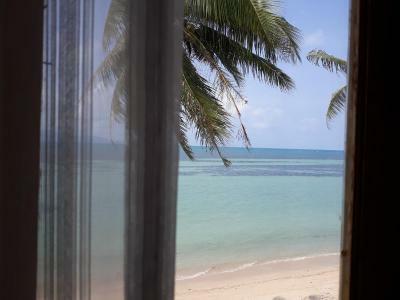 Lock in a great price for First Villa Beach Resort – rated 8.2 by recent guests! Staff was very helpful and friendly. Front desk staff helped us call a taxi to and from Half Moon Party. 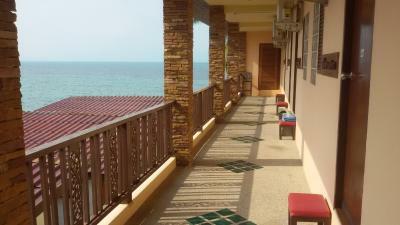 Nice seafront bungalow, good food, nice and friendly staff. Beautiful sunset views. The staff was amazing. They were very friendly and helpful. I couldn’t have been happier with the body paint they did for the full moon party! The food that coming out from their kitchen is so damn delicious and then their staff especially Mei is definitely one of the best. What a great find this was! Perfect location! Right by the sea with a pool in the property! Great food and hospitality. 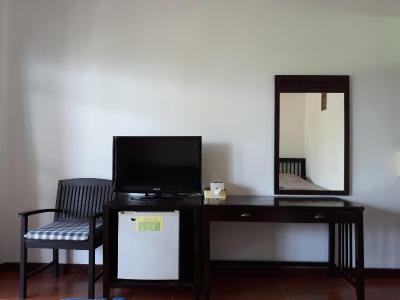 First Villa is a great place to relax and enjoy the area. 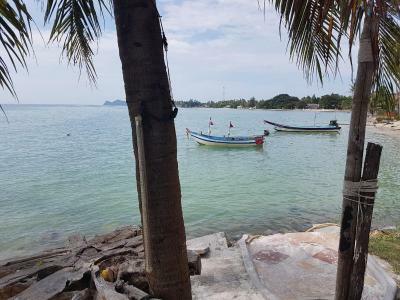 We were not here during a full moon party which was nice as we were just looking to have some quiet time and enjoy the island. The family that runs First Villa is fantastic and very accommodating. Their restaurant is also delicious, we enjoyed daily breakfast with my husband having the traditional Thai Rice Soup every morning which was fantastic. The great coffee was also a bonus to help wake up on those lazy island mornings. 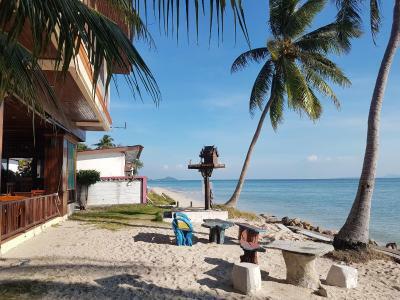 If you are looking for a party location, I wouldn't recommend, but if you are looking for a beautiful spot on the beach, friendly staff and nice accommodation I would highly recommend. We did extend our stay for another two nights. A little pricey for what you get but wasn’t bad. Located on a beach. Pool didn’t look as clean as the pictures. The receptionist was awesome. She had a great sense of humor and she was very knowledgeable about the island. The food and coffee were very good. I loved the laid back atmosphere and the beach. 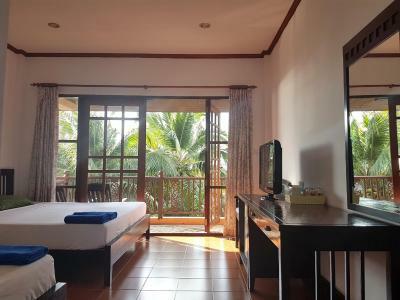 First Villa Beach Resort This rating is a reflection of how the property compares to the industry standard when it comes to price, facilities and services available. It's based on a self-evaluation by the property. Use this rating to help choose your stay! 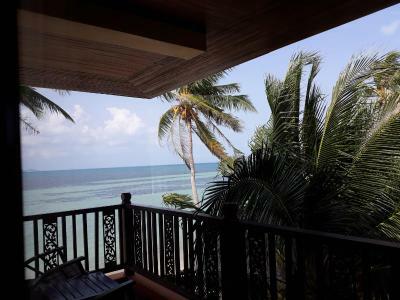 Enjoying a beachfront location on Ko Phangan, First Villa Beach Resort offers spectacular views and charming accommodations for a great value. Refreshing dips in the outdoor pool await guests. Free WiFi in public areas. 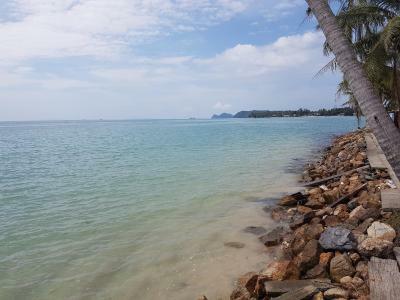 The First Villa Beach Resort is nestled on Baan Tai Beach, surrounded by tropical gardens. 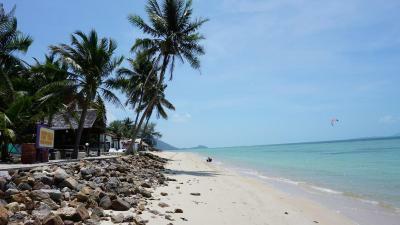 It's a 15-minute ride from Haad Rin, famous for hosting Full Moon parties. 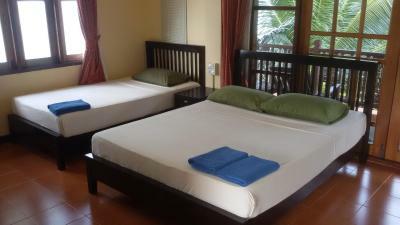 Other nearby attractions include Haad Yao and Thong Sala Town. Guests can pick between cozy rooms and standalone bungalows. They all have private balconies and bathrooms, air conditioning, a TV, and a fridge. The private bathroom features a hot shower powered by solar panels. 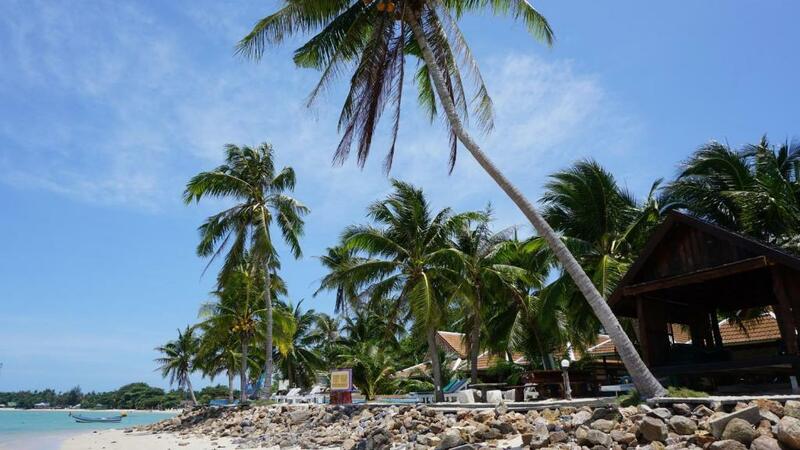 Guests can make the most of the tropical climate by renting motorbikes or cars to explore the island. Sightseeing tours can also be scheduled at the resort. The on-site restaurant serves local and Western specialities and meals come with ocean views. Room service is also provided. 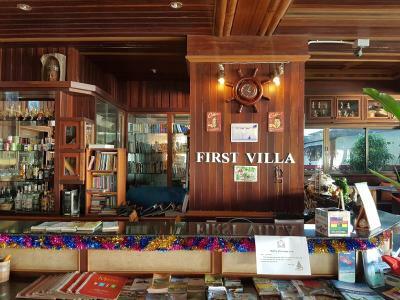 When would you like to stay at First Villa Beach Resort? They have air conditioning, a TV and a fridge. Features a bathtub and views of the garden. 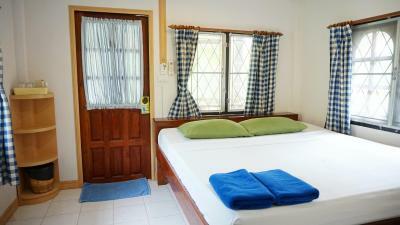 Standalone bungalows feature great views of the sea and are equipped with a bathtub. A spacious room featuring a private balcony. No extra bed is available for this room type. Rooms are 164 feet from the pool, the restaurant and the beach. We are Family Resort. If you expect for Luxury & Perfect Things, we are not. 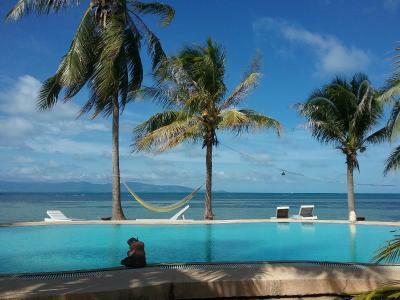 But if you want to get relaxed and chilled out by local island style..Come on,guys. Don't worry,be happy. House Rules First Villa Beach Resort takes special requests – add in the next step! First Villa Beach Resort accepts these cards and reserves the right to temporarily hold an amount prior to arrival. Please inform First Villa Beach Resort of your expected arrival time in advance. You can use the Special Requests box when booking, or contact the property directly using the contact details in your confirmation. Everything. The location. The staff. The food. Scooter rental from resort was great. The staff were lovely and really helpful when it came to booking trips or taxis. The place is beautiful and on the beach with amazing views! Really peaceful. Rooms need updating but this is reflected in the price. Walking out of our room to the pool (10 steps) and the beach (15 additional steps) was magical. The beach was lovely and we swam every day. Sunset was gorgeous. Food was good, staff was excellent, extremely helpful with all of our needs. We could walk to 7 eleven and other places to eat on the main road or the beach. Very convenient. This was the highlight of our Thailand trip! We felt super welcome. The staff was very, very friendly! Food was yummy and our bungalow perfect for our taste. We‘ll be back! The place really needs some love, it’s a beautiful location but the hotel is just not up to standard. We didn’t sleep the 3 nights stay we were there as the air con was so loud and also inefficient, it was right above one half the bed so sleeping on that half of the bed was freezing and on the other half was boiling hot! Dirt all in the bathroom (there seemed to be dirt crumbling from the wall around the bath) I got in the pool and had to get out as was so dirty- looked like it was filled with dead skin, my boyfriend said it was algae, but either way not something I wanted to swim in. It’s a shame as the pool looks so lovely and we had a seaside bungalow so we could step right out to the pool and into the beach, but could not use the pool. Everything just seemed past it’s best and everywhere needed a good clean. 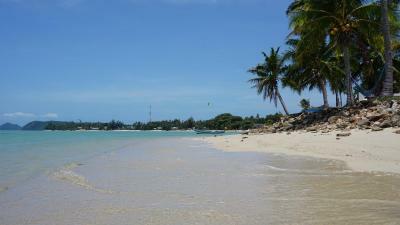 Location was great, nice quiet beach, perfect for kite surfing and to watch the sunset. easy to get to Thong Sala and Haad Rin by scooter. Far from the main road, if you are for the first time and not prepared for that. On arrival taxi put me down on main road and I had to walk with 2 luggages nearly 600 meters in a dark and bumpy side road not knowing exactly where it leads to I was quite frightened. Of course it was a bad taxidriver but just saying that I was not prepared to that long way in the dark alone. The pools had quite a bit of algae in them (cleaned while we were there so it was only an issue on the first day). The bed was a little uncomfortable. Staff were lovely, there was one pool and one jacuzzi but the jacuzzi wasn’t working. 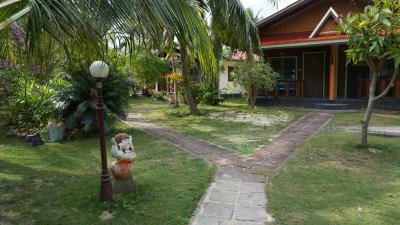 Good location, about a 15 minute walk to the restaurants & there was motorcycle hire available 200 baht a day. Lovely beach front as well.